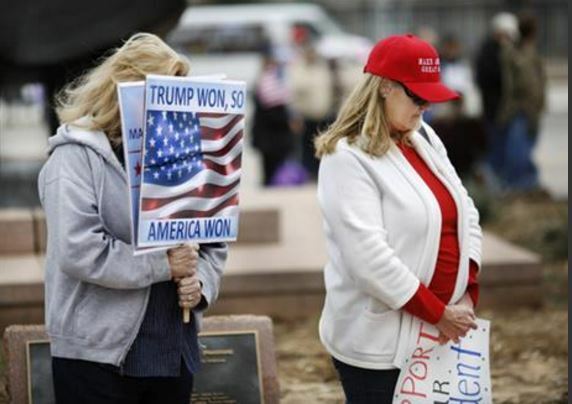 (AP) From Colorado’s state Capitol to Trump Tower in New York and the Washington Monument, groups of hundreds of people rallied for President Trump on Saturday, waving “Deplorables for Trump” signs and even carrying a life-size cutout of the president. The March 4 Trump demonstrations were planned around the country, and supporters clashed with generally smaller groups of counter protesters. Six people protesting the rally in St. Paul, Minnesota, were arrested on felony riot charges after they lit fireworks inside the Minnesota State Capitol and fled, police said. About 400 people attended the St. Paul event, and about 50 showed up to protest it. Some other minor scuffles between the dueling demonstrators were quickly defused. In Nashville, two people were arrested as protesters clashed with Trump supporters at the Tennessee Capitol. The groups at times cursed at each other and made physical contact, which state troopers broke up, WPLN reported. Chelsea Thomas, an accountant from Thornton, Colorado, brought her family to the rally — and a life-size cardboard cutout of Trump. She said the family has taken it with them on camping trips, boat rides and a country music festival. In Augusta Maine, more than 100 people turned out for the event that was supposed to last three hours, but ended early because of freezing temperatures. In Miami, supporters continued a rally while sipping espressos outside a Cuban restaurant, the Miami Herald reported. In Indianapolis, about 30 Trump supporters rallied at the Indiana Statehouse in Indianapolis to denounce what they see as unfair treatment of the Republican. One attendee held a sign saying, “The silent majority stands with Trump.” Some passing cars honked in support. Others shouted disapproval. In Lansing, Michigan, about 200 Trump supporters rallied on one side of the state Capitol while 100 critics gathered on another side. At one point, the president’s fans shouted “get on the bus” and “go back to Mexico,” The Detroit News reported.